Every year about this time I get major hair envy because it seems like everyone I know is going to Coachella or Stagecoach, and I’m over here seeing all these cute outfits and hairstyles posted via social media. 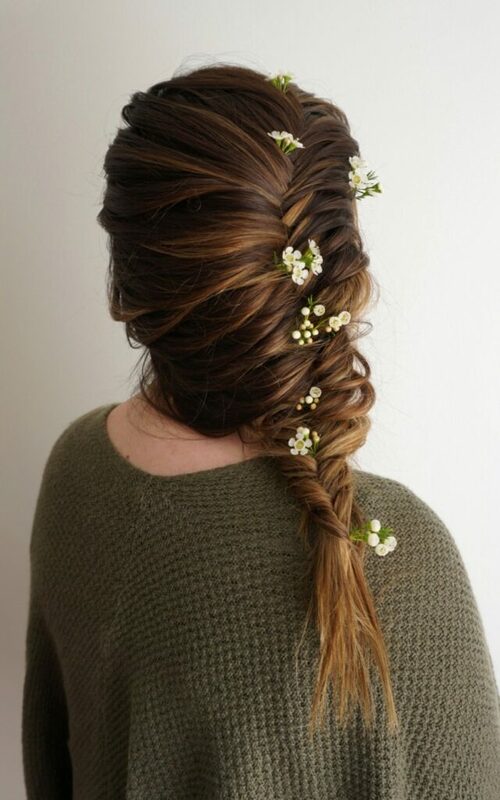 Since I won’t be going this year (again) I at least thought I could participate by giving you guys some ideas on how to incorporate flowers into your hairstyles! 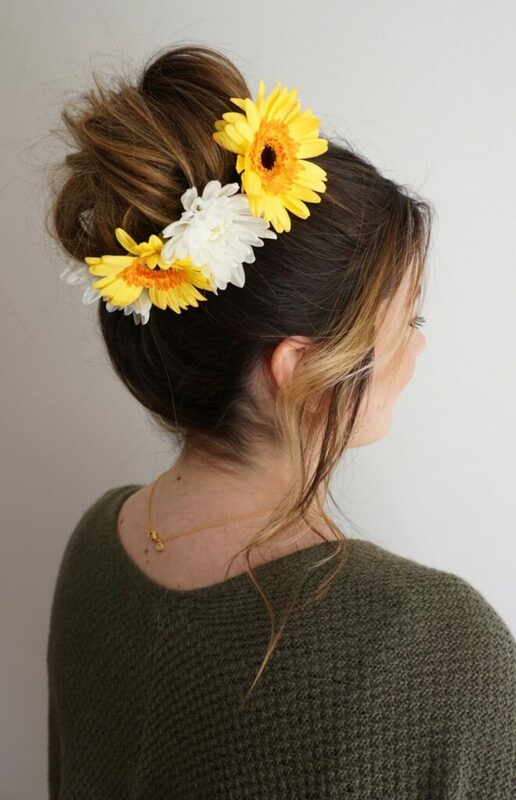 Perfect for springtime too! 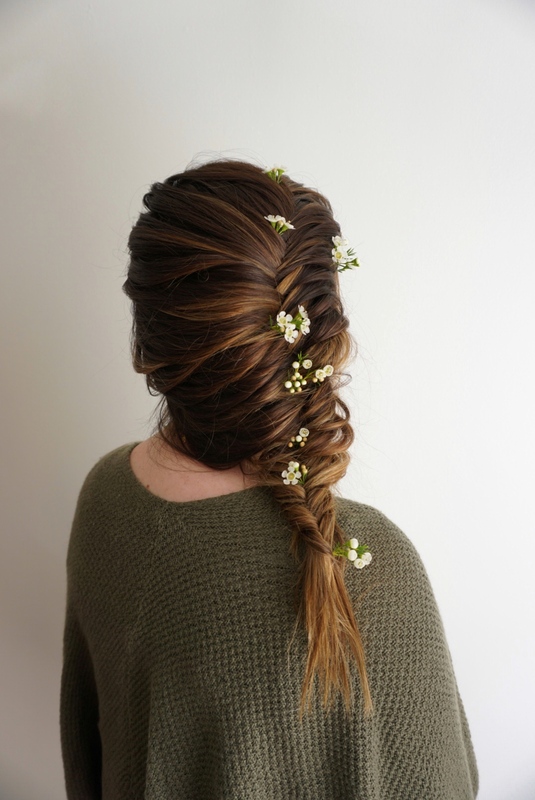 Fishtail braids are a year-round must, but incorporating little groupings of wax flower (shown in the photos) or baby’s breath really takes this french fishtail braid into festival territory. 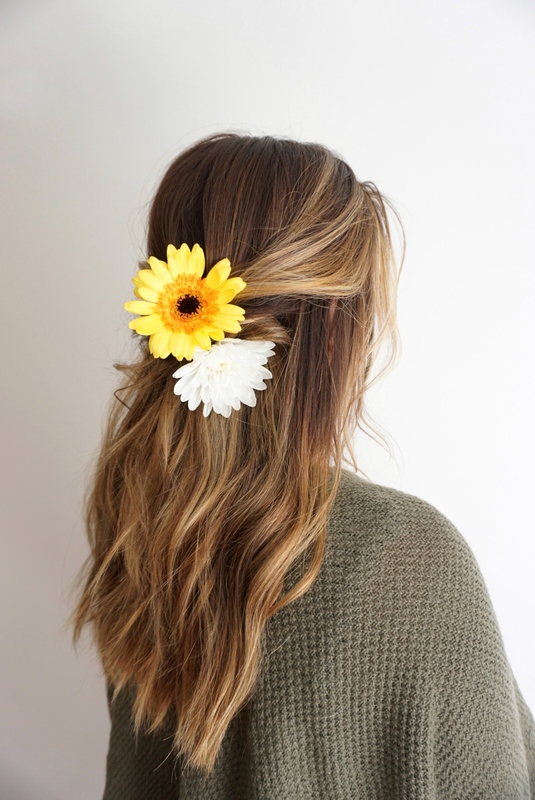 Don’t forget to leave wispy pieces out around your face to get that extra bohemian look! 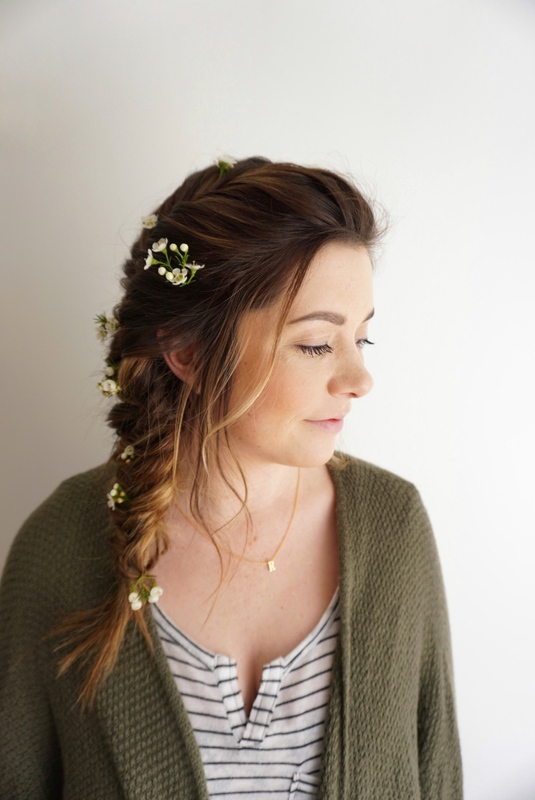 If you have highlights, blonde, or ombre hair color, the fishtail braid (or any braid, really!) will showcase all of your pretty dimensional color. Believe it or not, the half up style below was created with twists, not a fishtail! Can you spot the faux fishtail? (Hint: it’s in the middle). 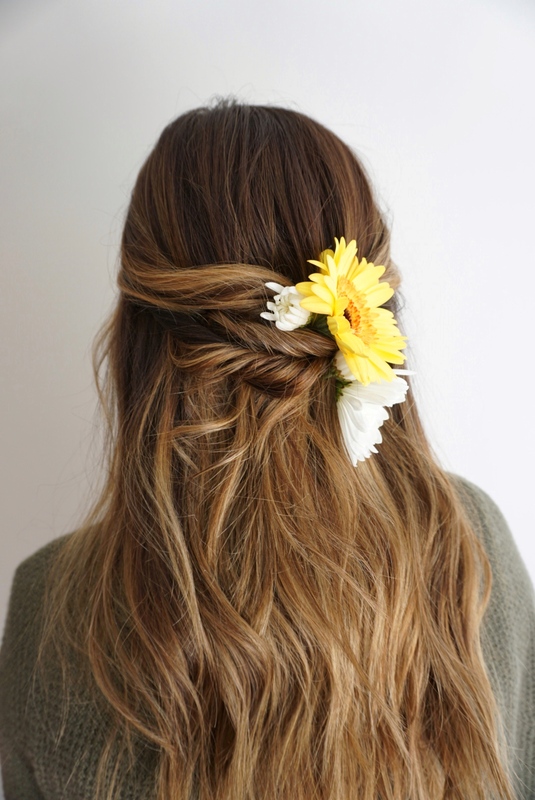 What’s great about using twists to pull back your hair is that you’ll get a slightly different look each time. So, if I were to take down my model’s hair and recreate this style, chances are it won’t look the same! It all depends on how you pin back the sections your twisting, and how tight or loose you make each section. Play! Have fun experimenting. 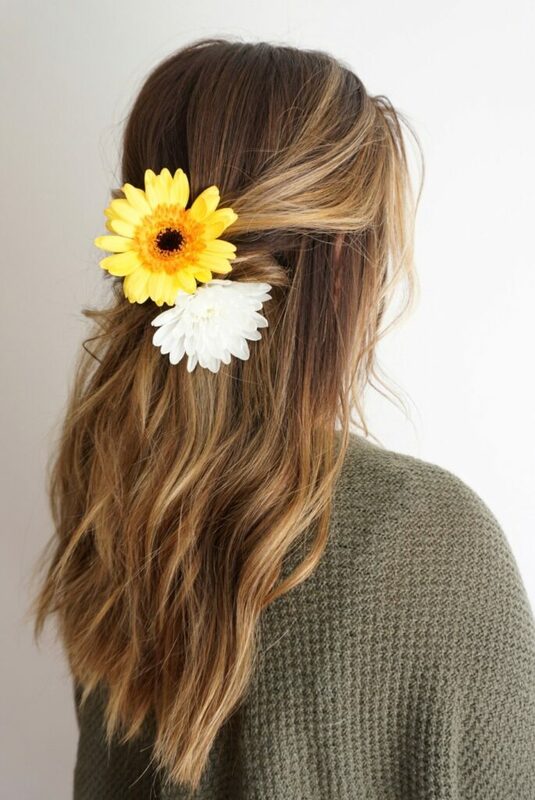 By adding in various sized flowers with bobby pins you will achieve a very sweet, relaxed look, almost like a mini bouquet for your hair. If you’re wanting to take this look from relaxed festival hair to a more formal springtime wedding hairstyle, I would recommend doing a structured curl rather than the extreme loose waves I did on my model. Whichever you choose, they are both really pretty options! If you are among the lucky crowd who will be attending one of the big weekend-long festivals this year, I bet you’ll be doing lots of dancing and soaking in the sun. 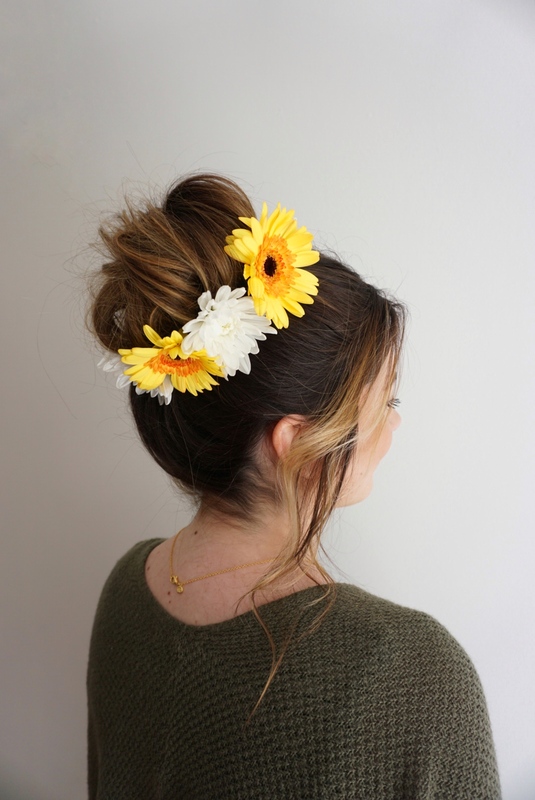 If you’re the type to throw your hair up into a messy bun when you get hot and sweaty, just make sure you save your flowers and pin them in like a little flower crown for your bun! Just do me a favor… have a blast enjoying your favorite music and be safe!